There is a chapel here in the Notre Dame Center. 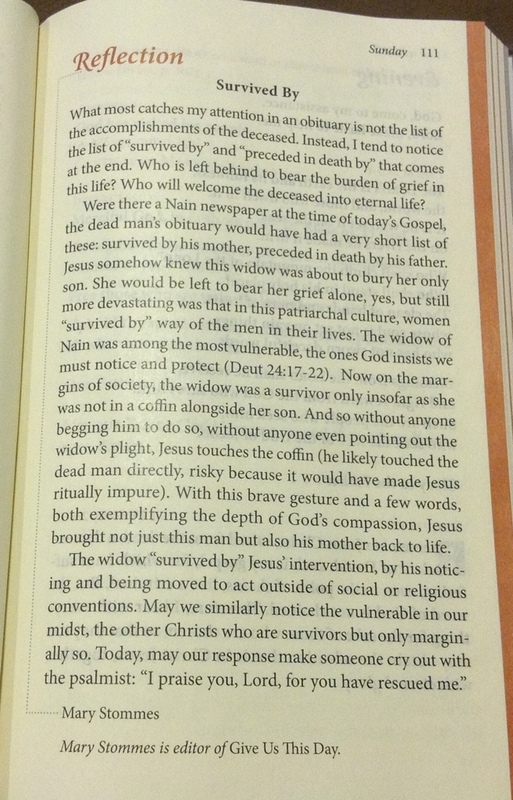 Yesterday my knee and I were in the chapel singing to ourselves and sitting together quietly and reading from our “Give Us This Day.” We enjoyed this reflection about Jesus and the woman of Nain. Perhaps the charm was that we are sitting in the Holy Land, not real near but close to Nain. Perhaps it was that we realized that, once we are back on our feet and are back home, we might use some of these thoughts for a homily at a funeral. We are all, and always, on a journey in the city of Nain. Thanks for sharing the reflection. The writer captures the essence of Jesu and his mission, compassion. Or suffering with another.